This original Memory Joggers package teaches multiplication & division facts, from zero through nine. PLUS, our 16-page Parent/Teacher Guide. NOTE: This does not include our 66-page Activity Book to reinforce memorization skills, or the multiplication & division system for the tens, elevens and twelves. 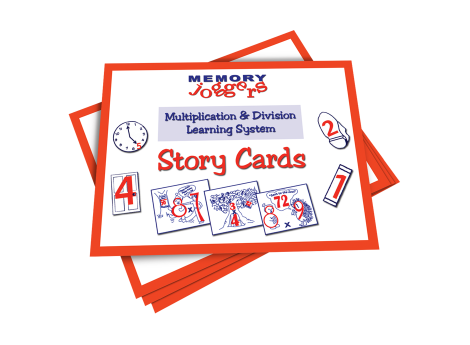 Buy the complete Memory Joggers Multiplication & Division Learning System. Either the Basic Edition or Deluxe Edition, for faster results and more value for your money! I have used Memory Joggers Multiplication and Division Story Cards for 15 years. I don’t know how I’d teach without them. My learning challenged students would never have learned their facts without them! Thanks Memory Joggers!